Though most commonly depicted as cylindrical objects, rounded edges are only one of many available options for these rods. Square, hexagonal and flat rods are commonly stocked with custom rod shapes also readily available. Common processes used to create titanium rods include hot forging, hot rolling, polishing, machining, extrusion, welding, casting and spinning. These techniques may also be implemented in the manufacture of specific titanium parts. These shapes may be used as rods or bars, for example in concrete reinforcement or structuring, but are more often melted down or reworked by manufacturers who buy titanium in stock form to create parts for such broad industries as machine building, aerospace, aircraft, shipping, transit, automotive, sport, medical and power generation. Titanium metal and titanium alloys are lauded for their low density, high strength and superior corrosion resistance. These qualities render titanium 45% lighter than steel of comparable strength and twice as strong as aluminum, copper or brass with only a 60% increase in volume. Resistance to acid, stress, oxygen, salt and microbiological corrosion make titanium the logical and most effective choice for underwater applications, as well as medical implants and prosthetics as it eliminates concern for allergic reactions to the material. Rods allow for easy transportation and use as volume is straightforwardly regulated and pre-forms make shipping and manufacturing processes much more predictable. In some instances, plants will also custom process rods and deliver the final product to consumers. Although titanium is the ninth most abundant element, making up 0.57% of the Earth’s crust, it does not occur in pure form and is instead found in ores, or mineral deposits, such as Rutile, Ilmenite and Sphene, from which it must be extracted. The most common technique for extraction is the Kroll method. This involves forming titanium tetrachloride through fractional distillation. The substance is then reduced to useable metallic titanium using magnesium. The resulting highly porous yield is referred to as a sponge. Rods are formed when this sponge, or bulk, is melted or pressed into specific shapes and sizes. Manufacturing techniques can be used individually or in conjunction with other techniques to form these stock and custom shapes. Rods are produced using either raw materials provided by the customer or using the resources available in a mill. Some mills will not manufacture rods from outside titanium sources without grade certification and mechanical property testing to ensure that they are outfitted with the proper equipment. Grade of material is a significant consideration as processing high purity titanium is extremely energy intensive. While titanium grades are of utmost importance, further property considerations include rod length and diameter which can vary considerably. Rod diameters, for example, range from ½ inch cross-sections to as large as 13 ¼ inch cross-sections. 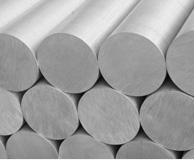 Titanium Rods Titanium rods are bars or billets of varying shape and size that serve as common mill forms. These are produced during titanium extraction, formed and then sold to titanium parts manufacturers.